This past weekend we had my parents as well as the boys parents over for a little pre-holiday celebration. And also partly because I did not invite them to my annual holiday cocktail party, that is the "kids" party. I tried two new recipes out on them and they both turned out very good and everyone enjoyed them. The first was an appetizer from Pillsbury the second is an Italian Meatloaf recipe that I kind of made up. The boy, my dad and his dad all love meatloaf so I thought I would give it a try, but I don't like regular meatloaf at all, probably because I don't like ketchup, but I made this up. 1. Heat oven to 375. Separate dough into 16 2-inch rounds. Spray cookie or baking sheet with cooking spray. 2. Place 1 to 2 cheese cubes and three slices of pepperoni into each biscuit and wrap around, seal and roll into a ball. Place 6 in a circle and 10 around the inner 6. 3. Brush with whisked egg, sprinkle with parmesan and Italian seasoning. Bake 25 to 40 minutes depending on oven. Serve with warm pizza sauce. 1. Heat oven to 375. In a medium size bowl, mix together ground beef, eggs, sausage, bread crumbs, 1 C. tomato sauce and salt and pepper to taste. 2. In a deep dish pie plate place half of the meat mixture. Top with thawed, rinsed and squeezed out spinach and shredded mozzarella. Place the rest of the meat mixture on top and form into a dome. 3. Bake for 1 1/2 hours. 10 minutes prior to the end, top with the rest of the tomato sauce and bake for 10 more minutes. That meatloaf looks delicious! I have been craving sausage for weeks. I keep joking that I want a nitrate platter delivered to the maternity ward after I deliver. Sausage, pepperoni, hot dogs, bacon, basically if it's got nitrates, bring it on! 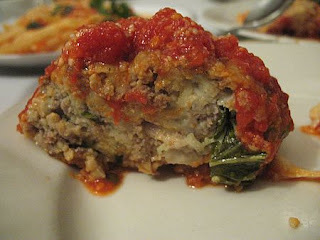 My hubby is Italian and he loves meatloaf. I will have to try these out on him. thanks for these. Yummy! I know 3 boys who are going to love these recipes. Thank you.